These machines are designed to handle denim and other thick materials. The patented Gliding Foot is especially designed to handle extra thick jeans hems and similar situations. Toyota Super Jeans SJ15B sewing machine features. Watch the TOYOTA's effortless multi-layer sewing with Gliding Foot! 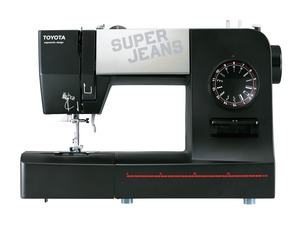 Threading Toyota Super Jeans sewing machine. Included Accessory Feet: Gliding foot, Overcastiong foot, Blind hem foot, Zigzag foot, Zipper foot, 4 Step buttonhole foot.